Kimberly Gager's garage is filled with so many boxes and miscellaneous products for Hurricane Harvey victims she can't park there any more. Laundry detergent, soap, diapers, baby wipes, formula — you name it, the San Antonio woman has bought it. She never misses out on a sale. The woman, who has been "extreme couponing" for about five years, says she's now using her unique skills to help those in need. "After Harvey, I kept telling my mom, 'There's something more that I need to be doing. I don't think I'm doing enough,'" Gager told CBS News. "So I put it out on Facebook." The mother of three volunteered to shop on behalf of anyone willing to donate toward hurricane victims. She expected a few friends to pitch in, but to her surprise, she received dozens of responses. "It kind of blew up," Gager said. Since then, Gager has been clipping coupons, making daily trips to the grocery store early in the morning and using her lunch break to deliver items to families who lost everything in the hurricane. She's spent about $2,700 — but gotten goods worth about $5,000 in retail price. "Sometimes I'm delivering until 1 or 2 a.m.," Gager said. "It's really becoming a second job. I've gotten very little sleep." Gager estimates she's made at least 50 trips to her local Walgreens and Target to stock up on items families have requested. "I'm in that store so much now that they know my name," she joked. "Now even at Target they see me coming they shut down a line and open another. They bring out pallets to roll items out to my car." So far, she's delivered items to nearly 30 families, including Carrie Chezem, a Harvey evacuee from Aransas Pass, Texas, who asked for diapers and wipes ahead of her son's third birthday. "Anything helps. We have no money to our name," Chezem wrote Gager. "This would very much mean a lot to our family." Gager met up with Chezem later that day to drop off the items she needed. She knows exactly how Chezem feels. In 1999, Hurricane Floyd destroyed Gager's Virginia home. Her son was 7 at the time. "Just a hug or a stick of deodorant or toothpaste — that would have been so appreciated at the time," Gager said. 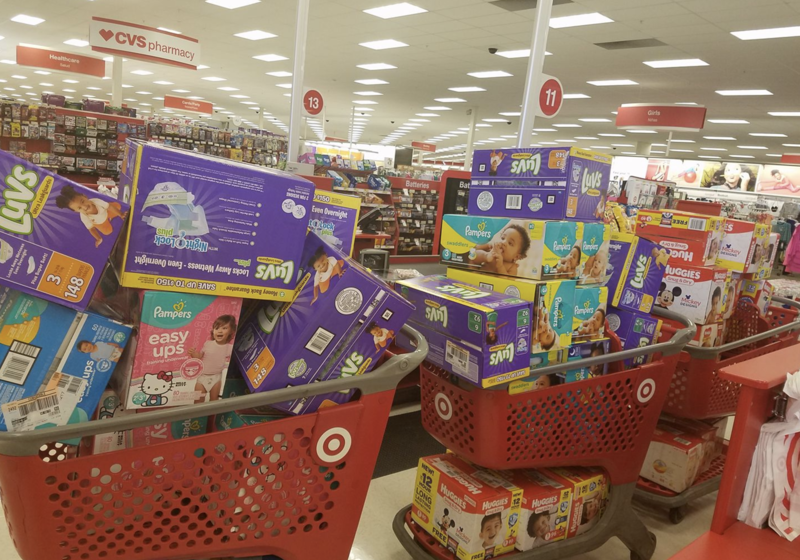 A pack of diapers and wipes may not seem like much, but it can mean a lot to those who have lost everything, Gager explained. "I just want to ease the burden."